BOONSBORO — Emilie Amt remembers it was about four years ago when she learned about the first marriage to take place at St. Mark’s Episcopal Church, where she is a member. The marriage was between Jeremiah and Malinda James, two slaves who were owned by one of the church’s founders. Amt, a history professor at Hood College in Frederick, Md., began to study the church register and explore the stories of the people whose names were recorded there. “We have a very rich history here at St. Mark’s, but much of the early history is entwined with slavery,” Amt said. She is on sabbatical from Hood and working on a project focusing on slavery and the Episcopal churches of Washington County and a book about slavery in Washington County. On Saturday, Amt was the featured speaker at “Day of Reflection: Slavery and St. Mark’s.” About 50 people attended the event at the church on Lappans Road in Boonsboro. Amt presented a lecture in the stone church, which was founded in 1849. The eight founding members of the church owned a total of 53 slaves, she said. Amt pointed out a balcony that was built in the church where slaves were permitted to sit during services. “It’s been such a journey to learn about the enslaved people who built up so much of our heritage here, and to learn about the legacy of slavery and the painful history that we are still suffering from today,” Amt said. She spoke of Maria, a 7-year-old slave girl who was given as a gift to a newborn white baby. “These are stories that really make you understand the meaning of slavery much more deeply than just seeing a wedding record, a baptism record,” she said. Following the lecture, participants went to the graveyard on the church lawn, where Amt pointed out three gravestones of slaves. 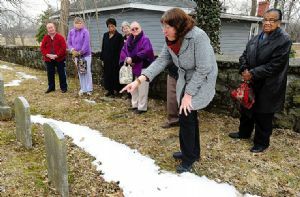 The historically black section of the cemetery was discovered only a couple of years ago, she said. “These stones were sitting here. We didn’t know who they were, really,” she said. One stone marked the burial site of Isaac and Letty Ann Warfield, a slave couple who had three girls. Amt shared that Isaac Warfield had overheard one day from a white person that one of his daughters was going to be sold away. The family escaped to Pennsylvania, which Amt said was “incredibly surprising,” and lived there until the end of the Civil War before returning to the area and building a house that stands today on Breathedsville Road. Isaac went on to rejoin the church, and was baptized and confirmed there as a 75-year-old man, she said. Another stone marked the burial place of Fanny Wade, who is listed in the church register as a communicant — meaning she was confirmed and could take communion — following the Civil War and after emancipation. Amt called the third grave marker “the most mysterious and exciting stone.” It marks the site of Cornelius Johnson, a 12-year-old boy who died in July 1863, the month that the Battle of Gettysburg occurred. Amt wondered if he died as the result of fierce skirmishing in the local area following that battle. Reba Bullock of the Episcopal Diocese of Maryland spoke on racism following lunch. “We are working to learn the truth of our past so that we can just acknowledge what happened, how white people have benefited from slavery, and to reconcile that sin of slavery on our own lives,” Nelson said.